Dogs were first used by the police in the early 1900s, and by the 1950s the modern era of police dog use was underway in the United States. Since then police dogs have served as a tool for detection and identification and as a weapon to fight crime. They are now widely used for search and rescue, tracking, identification lineups, drug and bomb detection and the apprehension of criminal suspects using the bite and hold technique. The benefits specially trained dogs bring to the police are remarkable. Nonetheless, despite their tremendous benefits, they are viewed by many as vicious and dangerous animals. Baby boomers may recall how police dogs were used to quell the historic civil rights demonstrations in Birmingham, Alabama in 1963. More recently, video footage on the Internet shows police dogs chasing and threatening people during the riots in 2011 in Vancouver and London. Also, inner-city residents have good reason to fear police dogs: Attacks on people by police dogs are disproportionately high when compared with attacks on people in more affluent areas. African-American teens have been called “dog biscuits” by Los Angeles Sheriff Department canine handlers. And there are many substantiated instances in which K-9 handlers used their police dog to attack and bite a suspect rather than using a less violent means for apprehension. Attacks on innocent bystanders happen at alarmingly high rates, and for no apparent reason, police dogs have been known to jump out of patrol cars and attack a nearby person. Attacks by police dogs on humans have therefore led to numerous lawsuits. Victims have been paid millions of dollars in settlements. A field trip by middle school students to a courtroom is an example. The police handler spread marijuana residue on some students to demonstrate the drug detection skills of his dog. However, rather than alert to the presence of marijuana, the dog instead violently bit an 11-year-old boy on the leg. The case settled for over $200,000 against the city of Brazil, Indiana and the Brazil Police Department. In California, the city of Hayward settled a case for $1.5 million when an off-leash police dog, searching for a suspect, mistakenly attacked a man sleeping under a bush. In another lawsuit, the city of Pittsburgh (CA.) settled a case for $145,000 because of the plaintiff’s claim that excessive force was used by a police K-9 in his apprehension. And in 2017 the City of Palo Alto settled a lawsuit for $250,000 when a police K-9 jumped through the squad car window and mauled a 16-year-old boy who had already surrendered. This article explains why police K-9s attack with excessive force. The discussion is made using an animal behavior perspective. The material is presented in the context of current law concerning liability against municipalities for constitutional violations of a person’s fourth amendment rights. Police dogs used for suspect apprehension are usually Belgian Malinoises purchased in Europe and brought back to the States for sale to the police. The dogs are selected from breeding lines that have been developed to imbue aggressive propensities in a dog. The dog may be tested to determine its suitability for police work at the time of purchase. Dogs are usually about two years of age at the time of purchase. The first level of Schutzhund training has already been taught to most dogs. Schutzhund training teaches obedience, tracking, and protection. The dog’s inherent aggressive tendencies are capitalized upon and further developed through Schutzhund training. Schutzhund training sets the foundation for the later teaching of the bite and hold technique. A handler takes the dog under his tutelage as his K-9 “partner.” The head of the canine unit of the municipality’s police department oversees and is responsible for the selection of the handlers, the development of policy and procedures regarding the use of canines, monitoring the progress of the K-9 teams, their training, and reprimanding, temporarily removing or retiring the handler or dog from service. The policy of most police departments requires that the handler train his dog on a regular basis. Training records must be kept by the handler detailing the progress and behavior of the dog during training sessions. Usually, most police dogs serve a dual function: Drug and bomb detection and the apprehension of criminal suspects. Subsequently, the handler and his dog are certified as a team before their approval for use in the field. 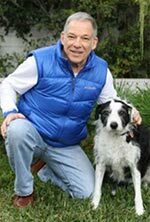 The principles of animal behavior science that govern aggressive behavior in dogs are the same regardless of the type of dog. Hence, the causes and mechanisms which underly police dog behavior and aggression (e.g., genetic propensities, motivation, cognition, conditioning and learning, arousal levels, impulsivity) are identical to those used to explain behavior and aggression of a pit bull or any breed. Animal behavior science explains why attack-trained police K-9s are inherently dangerous animals. First, police K-9s are genetically programmed for heightened aggressive arousal and low attack thresholds. Second, attack-trained police K-9s are taught to apprehend suspects using the controversial technique of bite and hold. Currently, in the United States around 2,500 police departments have K-9 units and up to 75% of these units train their dogs to bite and hold. This technique teaches the dog to viciously attack a suspect by biting, vigorously shaking, forcibly latching onto the suspect’s arm or leg, and then holding its bite until commanded to release by the handler. Many hours of training are needed to teach this technique to the dog. And even if the dog becomes relatively skilled in this technique during training sessions, the method often breaks down when the dog is deployed in the field. The method is fraught with serious problems because it is unreliable. Moreover, bite and hold trained dogs usually inflict severe injury on a person and frequently the dog will refuse to release its bite after latching onto the suspect. Third, attack trained police K-9s bite with tremendous force. This force is of high magnitude, certainly no less than the strength of a bite from an aggressive pit bull or Rottweiler. It is a force that can easily cause severe and permanent injury to a person. Its intensity has been compared to “an automobile wheel running over a body part.” Not surprisingly, one study found that when compared with bite injuries inflicted on people by non-police dogs, bites from a police K-9 resulted in more severe damage, longer hospitalizations, more surgeries and higher hospital costs (Meade, Police and domestic dog bite injuries: What are the differences? What are the implications about police dog use? 2006 Injury, 37, 395-401). Another study found that the use of canine force resulted in more trips to the hospital (67.5% of the time) than the use of other kinds of force such as a baton or laser (22% of the time or less) (McCauley, The Police Canine Bite: Force, Injury and Liability 2008 Report for the Center For Research In Criminology, University of Pennsylvania). 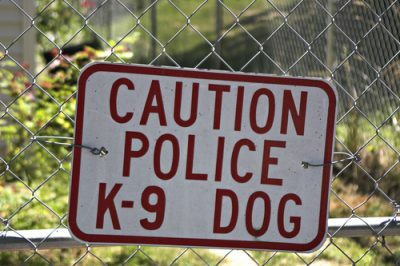 Fifth, police K-9s frequently attack the wrong person. There are many documented accounts of vicious attacks on innocent bystanders. Attacked-train police K-9s are eager to attack the first person they find after being deployed in the field to search for a suspect. These dogs do not have the cognitive abilities to differentiate suspects from non-suspects. Sixth, police K-9s are difficult to control. For example, it is often difficult to get the K9 to stop an attack even after the suspect has surrendered or been subdued. The handler’s lack of control over his canine partner stems from a combination of factors. Namely, (a) the aroused emotional state the dog is in during an attack; (b) the strong desire to find a person to attack; (c) the bite and hold training the dog has received; (d) poor selection of the dog at the time of purchase, and (e) an inexperienced or poorly supervised dog/handler team. A shocking video illustrating an out-of-control K-9 can be viewed at http://www.sandiegouniontribune.com/news/public-safety/sd-me-dog-lawsuit-20170718-story.html. This kind of force is delivered by an inherently dangerous animal and not a human. Hence, it differs from other weapons of force used by the police for suspect apprehensions, such as a baton, a taser, pepper spray or a gun. As such, canine force is a type of force that cannot be easily or quickly controlled. Hence, when applied to apprehend a suspect, there is the high probability that it will be delivered excessively and in a manner that violates a person’s fourth amendment rights. 1. Attacking a suspect is rewarding for the K-9. Much like eating a dog biscuit is reinforcing to a hungry dog, the act of attacking is likewise rewarding to a dog who has been trained to attack. The self-reinforcing nature of aggression is well documented in the animal behavior literature. Moreover, the handler may praise the dog during an attack which further strengthens the dog’s desire to attack a suspect. These factors create a dog eager to attack and resistant to stopping its attack. The difficulty many handlers have in calling their dog off the suspect, either physically or with a verbal command, allows the attack to continue for unnecessarily long durations. 2. This force is high on the use of force continuum. Courts have ruled that the force from an attack trained police canine is non-deadly (Robinette v. Barnes, 854 F.2d 909 (6th Cir.1988). Most police departments classify this force high on the use-of-force-continuum, placing it just below a deadly force, such as a gun. Given its high position on the force continuum, there is a greater chance that this force will be delivered in circumstances that do not warrant its use because: (a) the agent of delivery is a highly aroused animal eager to attack, and (b) overzealous, inexperienced or racially biased handlers choose to use the K-9 rather than other lesser force options. 3. This force is unique because it is delivered by an animal. It stands worth repeating that this kind of force is delivered by an inherently dangerous animal and not a police officer capable of making split-second decisions. A dog is incapable of modulating the amount of force delivered so that it is commensurate with the circumstances present at the time of the incident. In contrast, a police officer knows when to modulate other kinds of forces such as the strength or frequency in which a baton is swung or the delivery of a taser. The bite and hold trained K-9 does not have the cognitive capacity to determine who to attack or know the circumstances which warrant an attack. This concern becomes problematic when the dog is off-leash as often is the case when the dog is searching for a suspect. And even if the handler is nearby, the dog is dependent for a command from the handler to stop the apprehension. However, often this is challenging because the dog will not listen. A bite and hold trained K-9 during apprehension is highly aroused and therefore resistant to separating itself from the suspect. Hence, it is understandable why the dog continues with what it has been trained to do. Namely, attack and bite a person. Part II in this series continues by discussing the liability of municipalities for excessive force claims caused by police K9s. Read more on Wikipedia about the history of police dogs in the United States.